As the sun is starting to shine more often I was in desperate need of a good pair of sunglasses. I already have a gold/brown pair from Quay Australia, which I picked up in London last year, but I really wanted to have another pair. The pair I was eyeing up the most are the Quay 'My Girl' sunglasses. The blue, mirrored glasses and the cat eye shape make it perfect for the summer. 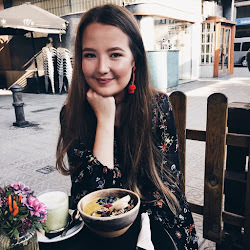 Since I already spent way too much money on summer clothes I decided not to make the purchase, but I did find a pair from Quay in the ASOS sale section that were right up my street and so affordable too. This model is called 'Girly Talk' and they were discounted from €42,40 to €16,90. I love the cat eye shape and the purple glasses. I also like that they are cool toned and don't have any gold in them. It really makes them different from any other pair I own. These are definitely more a statement piece compared to the other pair. The coloured, mirrored glasses definitely have to take the blame for that! What is your favourite pair of sunglasses? 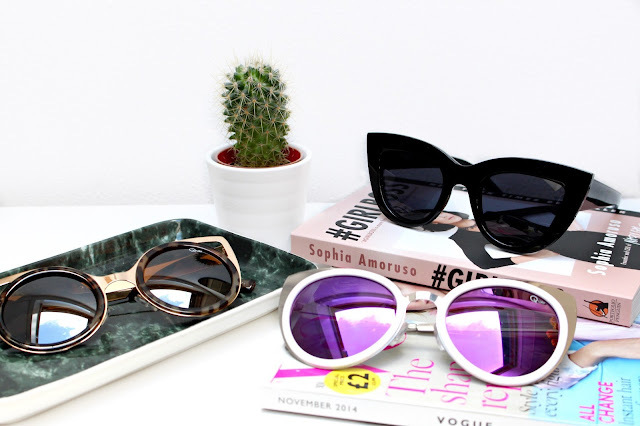 I'm very partial to the cat-eye shape when it comes to sunnies! Those from asos look really glam. Love those ones with purple lenses! I need some new sunnies for summer! quay has the best sunglasses, i have one pair but i definitely need more!